Highways England has issued an apology to Peterborough residents for the monumental delays and traffic gridlock experienced city-wide yesterday. Since the 24\7 closure of the slip road onto the A1 southbound at junction 17, (from Fletton Parkway) on Friday night, traffic has been diverted back along the eastbound parkway, off at Hampton, past Serpentine Green and onto the A15, through Yaxley to Norman Cross. 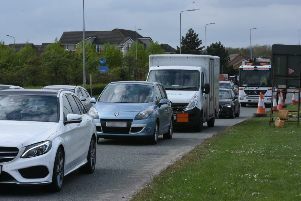 The result as people went back to work yesterday was mile upon mile of queues which brought Fletton Parkway, Nene Parkway, the A605, A15 and surrounding routes to a halt. Since yesterday’s gridlock Highways England have remained surprisingly quiet, failing to answer direct questions from the Peterborough Telegraph or requests from BBC Radio Cambridgeshire to come on air to discuss the roadworks. In a statement to the Peterborough Telegraph this lunchtime, a Highways England spokesman finally said: “We are working hard to sort out a solution to the issue (not just a response) and once we’ve done that I’Il be able to tell you what we are going to do. Yesterday’s statement can be read in full here. However Highways England have not been able to explain why its own ‘Public Notice’ published in last Thursday’s Peterborough Telegraph (pictured) made no mention of 24 hours closures during weekdays.